I didn't like this as much as I liked Steelheart, but that's not to say I didn't like it. I did like it, in fact the ending was epic, twisty and pretty much blew my mind. Just like with Steelheart, I didn't see it coming either. The writing is superb and the imagination that came up with the backdrop that is New Babylon is genius. I just struggled to get through the first three quarters of the book, it was kind of slow going for a while. It may be that I was just in a slump and didn't feel like reading, or it could have been the fact that I really loathe reading books on the overdrive app. It's so much better when there is a kindle book available for download. The app is too glitchy. David is so likable as a mc, though...the things going on in that boys head really do crack me up. "Megan looked at me and blushed. A blush looked good on her. of course, so would soup, mud, or elephant ear wax. Megan on a bad day outshined anyone else I'd ever known." I'm not sure, but I think he might have it pretty bad for her. 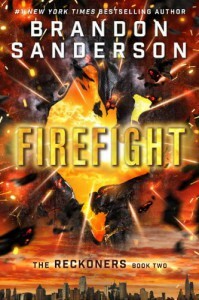 ;) Unfortunately, we didn't see Megan until the middle of the book and then only for a little bit at a time, I was beginning to wonder why it was called Firefight. I think Regalia would have been a better name for this book.